A useful support to all those who were preparing, or decided to travel with Transavia. Each person can carry a hand luggage of maximum size of 55x40x25 cm, including handles and wheels, for a maximum weight of 10 kg. If you decide to travel with Transavia, remember that the airline considers bags, women's handbags, laptop bags or video cameras AS BAGGAGE BY HAND. So try to gather your items in one package, to avoid paying extra expenses. For hand baggage, you can choose between two sizes. If your package is part of the 45x40x25 cm, it will have guaranteed transport in the cab. A green label will be affixed. Otherwise, if the dimensions exceed the 45x40x25 cm (without exceeding, obviously, the 55cm) it will have a red label, and it will be placed in the parcel shelf (where possible) or in the hold for free. Remember that, if at the airport, the baggage should exceed the size and / or weight, will be considered hold baggage, and boarded paying the cost of 40,00 € each way. Each person, with a valid ticket, can carry up to a maximum of 5 packages, for a total total weight of 50 kg per person. The maximum weight of a collar is 32 kg. Depending on the total weight of the 5 packages, the corresponding tariff will apply. Musical instruments and appliances are included in the hold baggage. Bicycles and other specific equipment (read later: ACCESSORIES AND EQUIPMENT) are subject to special rates. By purchasing your rate online, you will get a discounted price. The price increases by paying directly at the airport. For example, to carry hold baggage for a maximum weight of 15kg, you pay from 9,00 € to 18,00 € depending on the flight. For luggage weighing over 40kg, up to 50kg, the fare ranges from 66,00 € to 100,00 €. At the airport, you pay 15 € for each 5kg in excess. 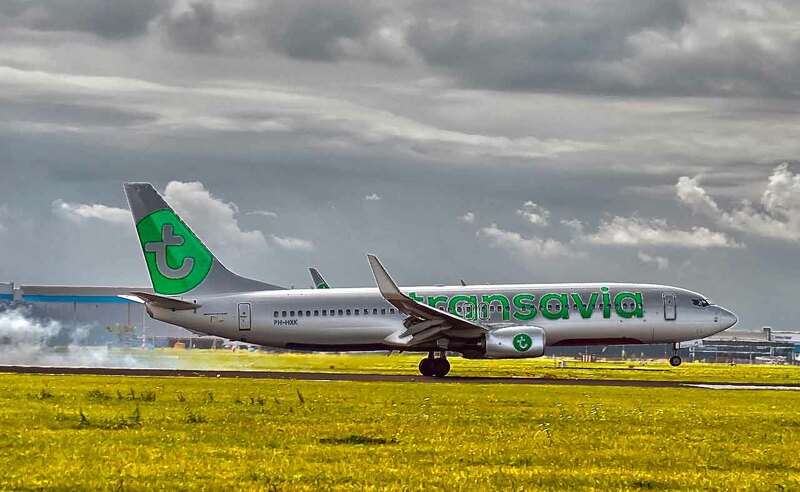 Traveling with Transavia means, above all, not having to give up anything. Whether you love winter sports, aquatic sports, or simply want to ride your bike. Transavia applies specific rates depending on your special baggage. - Golf equipment (1 bag with clubs and a pair of shoes) you pay 29,00 € each way. - Bicycle, with maximum allowed weight of 32kg, at the cost of 44,00 € each way. For all info, prices, travel precautions, we recommend the official website from this link. Those who decide to travel with Transavia with their faithful animal, can sleep peacefully. You can bring a dog or a cat on board with you, as long as you have made all the required vaccines. The dog or cat in the cabin, must be placed in a carrier with a maximum weight of 10 kg (including the animal) and with a maximum size of 47 x 30 x 27 cm. The carrier must be well ventilated and must allow the animal to move easily. Each passenger can carry at most 1 animal. For each flight, they can not travel more than 4 animals. The rate applied is € 40,00 each way. For transport in the hold, however, the carrier must have a maximum size of 102x69x76. The carrier must also possess the legal requirements of the International Air Transport Association (IATA). The maximum weight of the animal must be 75kg. Dogs and cats will stay in a specially-designed, heated, air-conditioned and pressurized hold area. The 60,00 € charge per way is applied. If you are traveling with hold baggage, or special baggage, you simply have to hand them over to the BAGGAGE DELIVERY BANK. If you are traveling with hand baggage only, you can go directly to the boarding with your boarding pass. Of course, you can always check in at the airport. You will need the identification document and booking confirmation.